The reason I publish new posts sparsely is that when I go to visit other bloggers’ sites, I stay there too long. It not only leaves me with little time to write but also makes me somehow intimidated. They are so good, these people. Go yourself and see! petersfoodadventures.com – Peter is a guy who lives in Australia, but was born in Canada to Russian parents, who were born and raised in China. He writes a lot about Russian food and Russian food means fermented whenever possible and this is how I discovered his blog. Peter is a person who definitely uses writing about food as a way to express the joy of life. I cannot help but feel that joy every time I read his blog. Go and check his awesome recipe for fermented tomatoes. 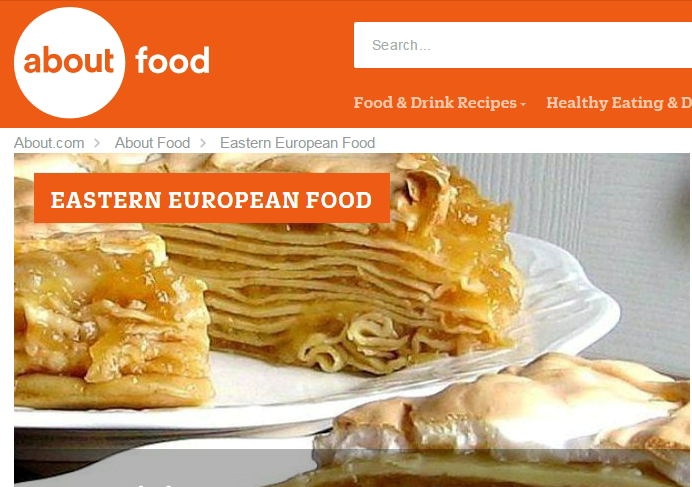 easteuropeanfood.about.com – I would LOVE to write about the Eastern European food like that! Barbara Rolek, who runs the blog (or rather the ‘topic site’), has a passion, knowledge and excellent writing skills. Well, according to the bio, she has been writing about food for the last 25 years and you can feel it. What I particularly admire is her patience and precision with explaining subtleties and some confusing aspects of Polish cuisine, like in this article about salads. rusakraut.com – this is probably the only website in the world dedicated (almost) entirely to sauerkraut. Let me know, if I am wrong, please. To me, sauerkraut is the king (or queen?) of all fermented foods and it deserves exclusive websites, surely! The articles on Rusakraut are written by Russian bloggers and chefs and it makes it very attractive. Who knows sauerkraut better than Russians? The site is a goldmine of recipes, ideas and facts I never heard of before. Pizza anyone? theculturedclub.com – this is a business website, but so different from other sites selling fermented food (or paraphernalia), probably because it is an Irish business. The marketing is very subtle; no pushy copies, just beautiful photos and short descriptions of what is on offer. And, of course, great, informative blog articles. One of them particularly warms my heart as it says about the owner’s trip to Poland. Thank you so much for the appreciation for our food culture and tradition and reminding everyone that hipsters didn’t invent sauerkraut. kombuchakamp.com – this, for the change, is very selly, American website and I love it, too. It radiates genuine, joyful energy. When I read it, I feel like jumping to the kitchen and starting brewing kombucha right away. The only reason I don’t do it is because I already brew kombucha. Also, the amount of information gathered on the site is enormous. You can find every little detail you wish to know about kombucha either there or on the YT channel.